The Virginia and Duke basketball game Saturday night was billed as a prize fight rematch after the two top five teams dueled to a two-point UVA loss last month. 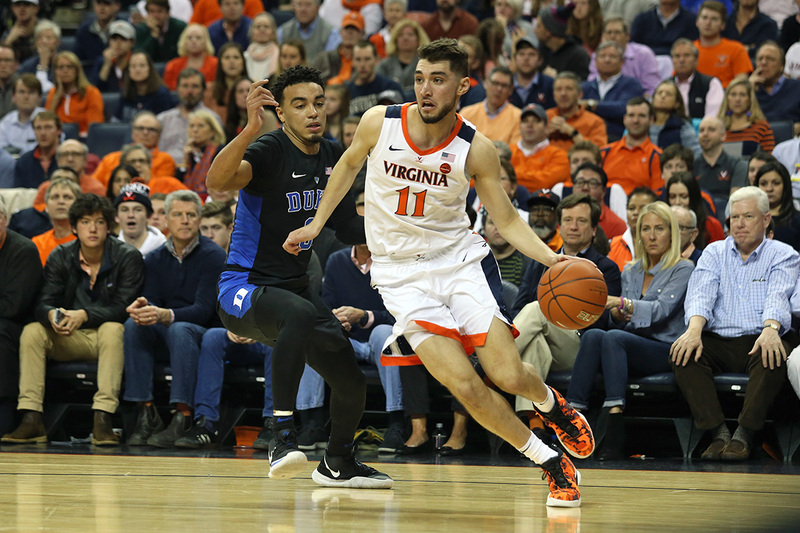 If a heavyweight fight was the comparison of choice, then the Blue Devils landed an early combination that didn’t deliver a knockout, but staggered the Hoos and they never caught up on the scoreboard. Duke won round two, 81-71, to sweep the season series. The loss snapped Virginia’s 13-game winning streak at the John Paul Jones Arena and dropped the Cavaliers to 20-2 on the season. Both losses came against the Devils. Indeed, the early one-two combo punch came behind the 3-point line for the Blue Devils and that sparked a hot shooting night overall for the visitors. RJ Barrett opened with a confident 3-pointer late in the shot clock on the first possession and added another just 18 seconds after Zion Williamson got a steal for a breakout dunk. That 8-0 start moved to an 11-4 edge when Williamson made a 3-pointer of his own and it was 17-9 when Cam Reddish and Barrett added two more triples in the game’s first six minutes. The 5-5 start from behind the 3-point line eventually became an 8-of-11 shooting line in the first half (72.7%) and a 13-21 night overall from behind the arc (61.9%). Four of Duke’s starters made a 3-pointer and all four shot 50% or better in the game from downtown. Barrett led the barrage by making 6 of 10, while Reddish hit 5 of 8. That shooting performance dwarfed the Devils’ season-long 3-point shooting stat of 32%. “I think we are a team that doesn’t get fazed very easily. 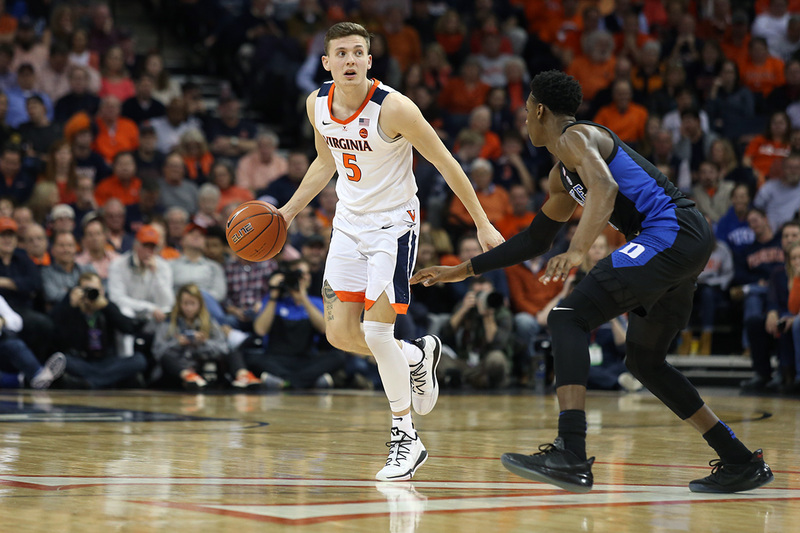 Obviously when they hit five in a row and seven out of eight, it is hard because it is an uphill battle all game and I think that we just need to do what we do best and we will do better throughout the year,” Cavalier guard Kyle Guy said of the early deficit. While the shooting display may or may not have stunned the Hoos, it certainly left them in unfamiliar territory. They entered the game leading the country in opponent 3-point shooting percentage at 24.7% allowed. As a result, the hosts trailed at the half for just the second time this season, though by that time they had whittled the deficit to four at 39-35. The other halftime deficit came in the loss at Duke. Virginia continued to try to rally in the second half as well, but every time the margin closed, Duke had an answer. With the lead at four 1:20 after intermission, Reddish hit another 3-pointer. With it at six again in the first four minutes, Barrett got an offensive rebound and scored. With it at five near the 12:00 mark, Tre Jones hit his only 3-pointer form the corner. With it at seven at the 7:36 mark following a Jack Salt dunk, Barrett nailed one of his triples. With the lead at five again after De’Andre Hunter canned a 3-pointer out of a timeout, Marques Bolden scored in the paint. With it at seven thanks to a Jay Huff 3-pointer with 2:25 to go, Williamson responded with a dunk. In other words, different guys provided points at important times for the Devils. That led to a balanced scoring attack. Barrett led all scorers with 26 points to go with 7 rebounds and 3 assists. Williamson added 18 points, 5 rebounds, 5 assists, 3 blocked shots, and 3 steals. Reddish tallied 17 points, 3 assists, 3 steals, and 2 blocked shots while Jones posted 13 points and 7 assists. Duke shot 57.8% for the game, the best vs. Virginia since Washington shot 58 percent on Nov. 22, 2010. The 13 made 3-pointers were the most since Pitt hit the same number on Jan. 4, 2017. Virginia finished shooting 46.7% (28 of 60) and 41.7% from 3-point range (10 of 24) as it tried to navigate a comeback. Guy and Ty Jerome led the way with 16 points each. Guy made 6 of 15 shots for his 16 points to go with 3 assists and 5 turnovers. Jerome made 6 of 11 shots for his 16 points to go with 4 assists, 3 steals, and 3 turnovers. Hunter made 4 of 9 shots for 11 points to go with 4 rebounds, 1 assist, and 1 blocked shot. Huff chipped in 8 points, while Braxton Key had 4 points and 10 rebounds. Mamadi Diakite had 7 points early with 10 first-half minutes, but he left the game and did not return after colliding with Hunter on a handoff play. Those numbers weren’t enough to keep up, though, thanks to some uncharacteristic issues that offset the offense. UVA committed 14 turnovers and that led to 17 Duke points. The Hoos also gave up some untimely offensive rebounds so while Duke grabbed just 8, it led to 14 second-chance points. Throw in the fact that Virginia couldn’t get to the free throw line (5 of 7 on the night), lost some toss-up plays on loose balls, and missed some opportunities on shots at the rim and it was too much to overcome against one of the nation’s top teams. We’re the possessions up in this game? It seemed like Duke had more success pushing the game pace than other teams. No. 63/64 possessions. Easy to push the pace on turnovers, particularly ones above the free throw line. UVA had several of those. * “That 8-0 start ballooned to an 11-4 edge”…An eight-point lead can’t “balloon” to a seven-point lead. * “I think we are a team that doesn’t get phased very easily”…Probably Kyle said that we don’t get fazed very easily. * It’s good that you mentioned Mamadi’s absence for more than half the game; most write-ups I’ve seen so far didn’t mention it. Considering that we were within five points of Duke with 5:25 left, and that Mamadi, an ever-improving player, started the game very strong but was able to play only 10 minutes, his absence alone could have been enough to deny us the victory. Please, no more Cavalier tete-a-tetes !!! Fair on ballooned. Phased was copy/paste of UVA quote. I saw Duke against Miami and they clanked more three pointers than I could count. If they have suddenly found the range like they did against us they will be hard to beat. It didn’t affect the outcome but I thought the officiating was the worst I’ve seen all year.